Khabib Nurmagomedov’s manager said he and Conor McGregor should be suspended. KHABIB Nurmagomedov won't fight Conor McGregor again, according to the Russian's manager Ali Abdelaziz. The spiteful aftermath of UFC 229 has continued with Abdelaziz taking several shots at McGregor during an interview posted on YouTube with ESPN's Brett Okamoto. 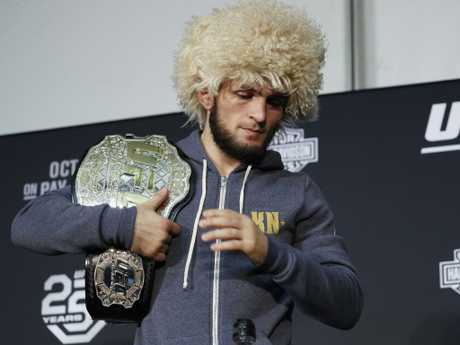 In a long wide-ranging interview, Abdelaziz said Khabib was toying with McGregor throughout the main fight of UFC 229 and the Russian star had no intentions of a rematch. "We have bigger fish to fry," he said. "He's (McGregor) in the past, we've just moved on. Right now he's zero, he has no value, we don't care about him, he can move on, enjoy his life, enjoy his family but he should be ashamed of himself for everything he said. "If people back up a little bit, he almost got knocked out by a grappler. I guarantee you, if this guy's going to keep talking and ask for a rematch, his family should try to stop him, his team should try to stop him, or they should get a life insurance for $100 million because he'll be done. "He says he want it but he don't want it. How you want something like that? How you want a nightmare hunting you for 25 minutes? You have to understand, Khabib carried this boy. "Khabib could have finished in the first, second, third round. He finished him in the fourth round. He carried him to punish him." Abdelaziz added he didn't think the UFC would want McGregor to fight again. "I don't think Dana (UFC president White) wanted him to fight Khabib too because at the end of the day Conor brings money but how're you going to have one of your biggest guys in the sport get killed two times," he said. "We know he's no good. Dana White knows he's no good. When Dana White made this fight, he knew this fight was going to make money but he knew who was going to get humbled." One fight Abdelaziz said he'd like to see is Khabib taking on Georges St-Pierre. The 37-year-old UFC legend recently called out Khabib and said it was the only fight that could lure him back into the octagon. "This is a fight I'd like to see, see who is the greatest because I think whoever wins, they can go down in history as the greatest," Abdelaziz said. "But at the end of the day, I don't think the UFC is going to go against and give Georges an opportunity to another title. I don't think the UFC is going to put a title on the line for Georges." Meanwhile, another legend has called out Conor McGregor with 43-year-old Anderson Silva telling TMZ Sports he'd be keen for a superfight. "Two big names. Two big legends. And, why not?" he said. "It's not about money, Conor. It's about martial arts challenge." Khabib’s has plenty of options for his next opponent including Floyd Mayweather and Georges St-Pierre. The McGregor-Nurmagomedov feud was simmering for months before the fight. Abdelaziz said it started back in Brooklyn, referring to the bus attack in April, which saw McGregor arrested. Last week, Nurmagomedov blamed the UFC for the attack. McGregor also threw plenty of verbal attacks at Khabib, which Abdelaziz said were "racist". 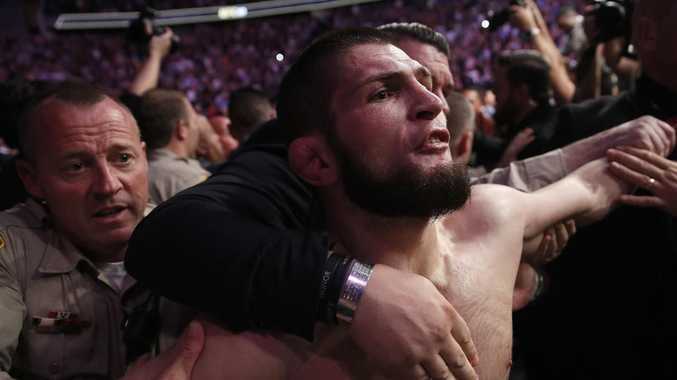 He said it contributed to the crazy scenes after the fight, where Khabib leapt into the crowd, sparking a brawl. With both men currently banned from fighting until a panel convenes on October 25, where lengthier bans will be discussed, Abdelaziz said both men should be suspended. "They have to be suspended because you have to show strength, you have show control," he said. "Is it justified - Khabib jumping over the cage? Of course not. He's not happy with that but as I said, there are limits. "We all have limits. We broke the rules, there are consequences when you break the rules, but there's also why we broke the rules. "This thing started in Brooklyn, it didn't start here. We respect Las Vegas, we respect the government of Las Vegas, we the athletic commission, all these people but this is not the Conor show anymore. Remember Conor threw the first punch in this whole thing." The hatred is still strong between the camps as Abdelaziz suggested McGregor should thank referee Herb Dean "because if he was not (there), Khabib would have broken his neck to pieces".